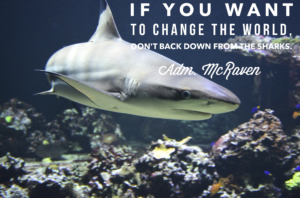 The other day, I came across a graduation talk given by a Navy Seal Admiral, (The link is below), which was phenomenal! It focused on the University of Texas’ slogan…….. The reason why I love this graduation talk so much, is that it is not the big, grandiose things that makes an individual great! Its the daily, unnoticed, hard things that creates greatness. Small and simple things that you can implement in your family life, that essentially can change the world! 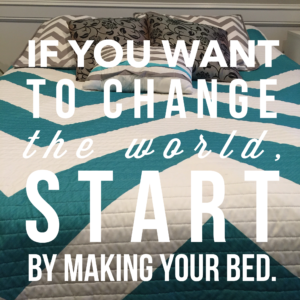 If you want to change the world, start off by making your bed! He says this gives you a sense of pride, your first task of the day accomplished. It teaches you that it’s the LITTLE THINGS in life that matter. Teach your kids young to make their bed. It truly is the little things that bring a big impact. Now, when I get up in the morning, making my bed is not the first thing I do, but its in the top 5 things I do. If I don’t get anything else done in my busy day, I love coming into my room with my bed made! 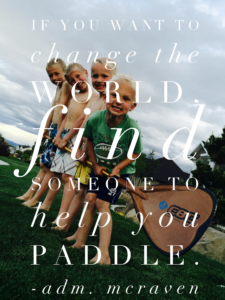 If you want to change the world then find someone to help you paddle. During SEAL training, one thing trainees have to do is paddle a small rubber boat, with their crew, out of the surf zone and miles down the coast. To accomplish this everyone must paddle together. MAMAS, find someone to help you paddle through life! I love love love this! If there is one thing that makes my day a little easier, it is talking with another mom who uplifts and makes me happy. Surround yourself with good friends who uplift you and make you want to be a better person. This can be a hard thing to do, when at times we find ourselves in our MAMA BUBBLE, so busy doing what we do everyday. Pop that MAMA BUBBLE and take the time to talk and be with other mamas going through the same thing you are. Trust me……ITS VERY THERAPEUTIC. 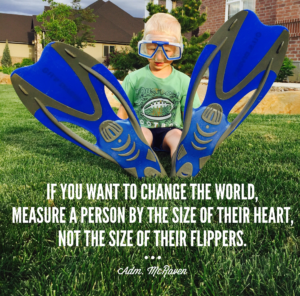 If you want to change the world, measure a person by the size of their heart, not the size of their flippers. The one crew they call the “munchkin crew” was the smallest and most diverse crew. Even though they were small, they always out-paddled, out-ran and out-swam everyone else. 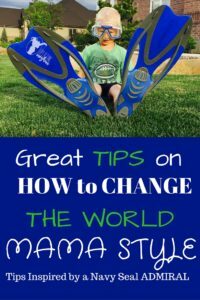 Sometimes, as a mom we feel like everything we do is being compared and measured against each other through conversations, Facebook posts, and Pinterest! Why do we do this to ourselves and to each other? Lets not look at a mother, who’s child has a saggy bottom, and automatically label her as lazy, or “not on top of it!” Get out of your comfort zone and get to know that mama and her story. You may find a treasure in her. We all have our moments when we feel inadequate to the task God has given us in raising our kids. We all do our best and we will be blessed because of it. 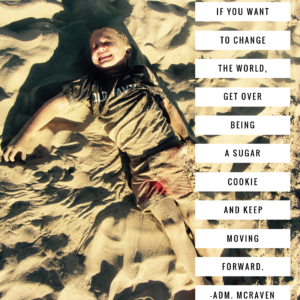 If you want to change the world, get over being a “sugar cookie” and keep moving forward. He relates this to when trainees have a uniform inspection. If everything was not in their perfect order, they had to run in the water fully dressed and roll around in the sand. Hence the sugar cookie. There were times that no matter how hard you try, or how perfect you think your uniform is, they still had to go jump in the water. Those who couldn’t accept that their efforts were in vain, or were left feeling unappreciated did not make it through training. As a mom there are many times that our efforts go unappreciated. There are many days when we may feel like everything we did that day, sweeping, vacuuming, laundry, picking up toys, was done in vain. These are the days we need to let go and move forward! Lets face it, our house will never be perfectly clean. 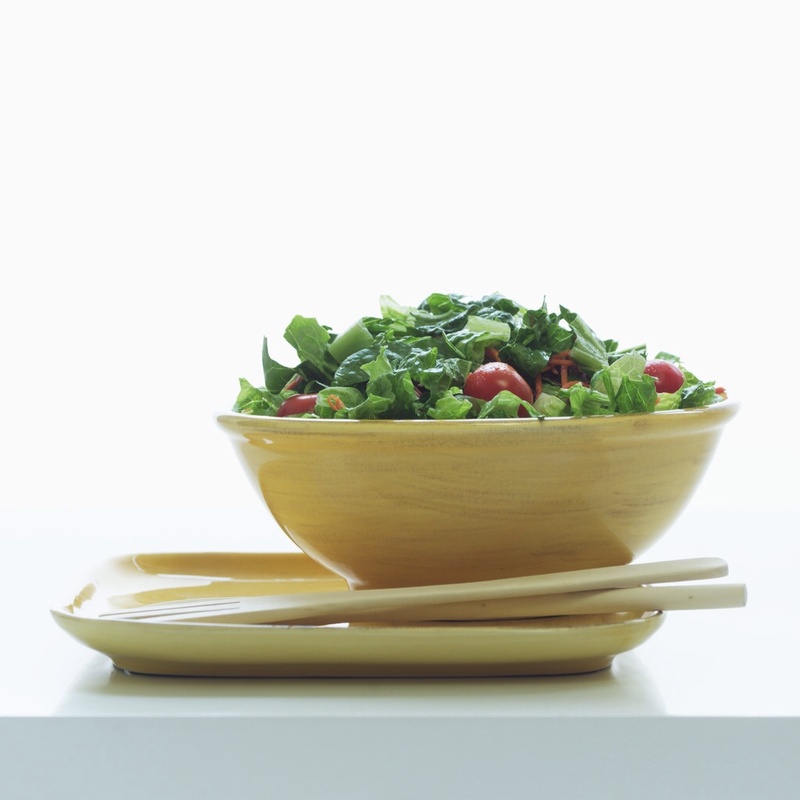 Do the basics and let everything else go. Spend that time loving on your kids! The dirty house will always be there tomorrow, your kids will grow and one day be gone. Cherish it today! If you want to change the world, don’t be afraid of the circuses. The circus is an extra 2 hour training that trainees get when they do not measure up. Every trainee ends up going through the circus. They are hard, and test an individual to their very core. I don’t know about you mamas, but there are days in my life where I am tested to the very core. Days when I feel like I can’t go anymore. 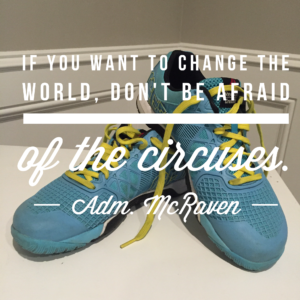 The circuses in our life makes us feel like we are failing as a mom. They are discouraging and trying. The amazing thing though is that those things that test us the most, makes us stronger! It builds an “inner strength that physical resiliency!” Don’t be afraid of the “circuses” in our lives. They will ultimately make us better moms! 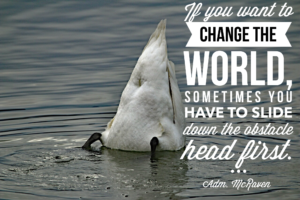 If you want to change to world, sometimes you have to slide down the obstacle head first. One trainee broke the long holding record of an obstacle course, by going doing a rope head first. This was a very risky move but he ended up beating the record. Being a mother is all about going headfirst. It’s a time of firsts for a lot of us. Some actions are a leap of faith with our kids, hoping they grasp the concepts we are teaching them. Don’t be afraid to try something new. That something new may be the very thing that will save you and your child! 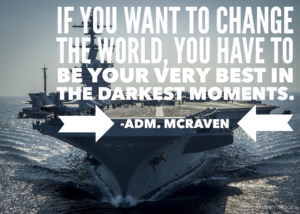 If you want to change the world you have to be your very best in the darkest moment! To accomplish this mission, trainees have to swim under a ship and find the keel. The keel is the center and the darkest part under the ship. Its at this time that all trainees know that they need to remain calm and composed. Ok mama! You know that moment when your child has just put the final straw on the camels back and you are about to break. Or the time when you have a newborn, you are living on little sleep, and the demands of motherhood just keep knocking on your door. These are the times we must dig deep and stay calm. Easier said then done I know! The more you stay calm during these dark times, the more your child sees your example. Its during these times your child observes and will take your traits and emulate them in their own life! Truly can be life changing. 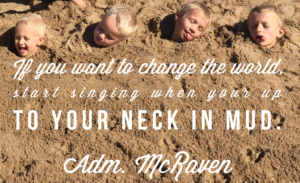 If you want to change the world, start singing when your up to your neck in mud! The 9th week of training, the trainees go through 6 days of no sleep and many challenges. One challenge is 15 hours neck up in freezing cold mud. If 5 trainees quit then everyone could get out of the mud. Just as it was looking like some were to quit, one trainee began to sing. This gave everyone hope and everyone joined in the singing. This is the power of hope! If we have hope that tomorrow will be better, and that our kids will turn out to be great, it saves us from quitting and giving up. When you are up to your neck in kids, poop, throw up, tantrums or whatever it may be, REMEMBER TO SING. 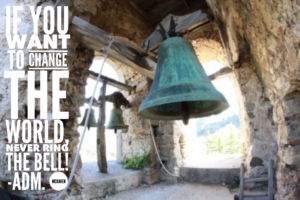 If you want to change the world, NEVER ring the bell. During training, if someone wants to give up, all they need to do is go and ring the bell in the middle of the compound. Mamas, never quit! Never give up on yourself, or your child. This quote sums it up pretty good. Click below to watch the amazing address yourself!